A little while back I was asked to join an Occasions Catalogue, Sneak Peek Blog Hop with an amazing line-up of demonstrators! I mean A-MAZ-ING! So, what else was I to say, but yes! ... and then fret about what I was going to create, so I didn't look juvenile amongst these stars! So, without further adieu... The Occasions Catalogue, Stampin' Up! Stars Blog Hop! Today's blog hop is show casing the up coming 2016 Occasions Catalogue, Which starts January 5th! This catalogue is chalked full of amazing new product and you'll absolutely drool over it! If you haven't been sold on the big shot just yet, this may just be the catalogue that pushes you over the edge! The dies in this catalogue are amazing! If you're already hopping through then you just came from the Amazingly talented and Artisan Winner: Allison Okamitsu. If you're just joining me, no problem! Start here and follow the links a the bottom of every post! Today I am giving you a sneak peek of the beautiful Love Blossoms Suite! This suite is absolutely stunning! A first glance, you might think this suite is just for the Valentine's Season - But it's not! It's very versatile, making it good for Mother's Day, Baby and Bridal showers and more! I had the pleasure of presenting and playing with this suite for the Mississauga (Ontario, Canada) Onstage event! If you attended this Onstage, you may have seen my project on the board. I apologize if this is the case, but I decided to share this today anyways, as there were only 300 attendees that day and this blog hop is worldwide, so I'm pretty sure this will be "New" to most of you. If not, you'll now have details that you just don't find on display boards. When I received the Bloomin' Heart Thinlits die and saw how beautifully intricate and detailed it was, I just knew I had to take it a step further, and show it's 3D potential! No lie this thinlit is STUNNING! The thinlit set come with with the large heart thinlit and 2 small coordinating flower thinlits. For my artwork I used 4 cut-outs of the Heart and a BAH-zillion of the small flowers. (okay... maybe not that many, but that's what it felt like when you can only cut 2 at a time! LOL). 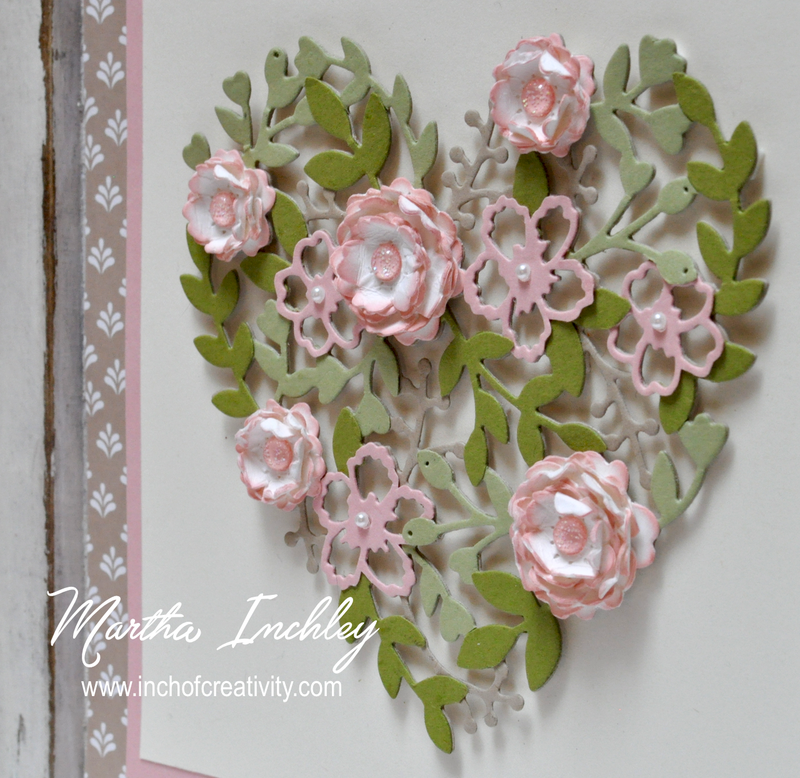 I used Crumb Cake cardstock for the base heart and this one I used as a whole. I then cut out one in Blushing Bride, Old Olive, and Pear Pizzazz. From those, I cut out the details and glued them in place. 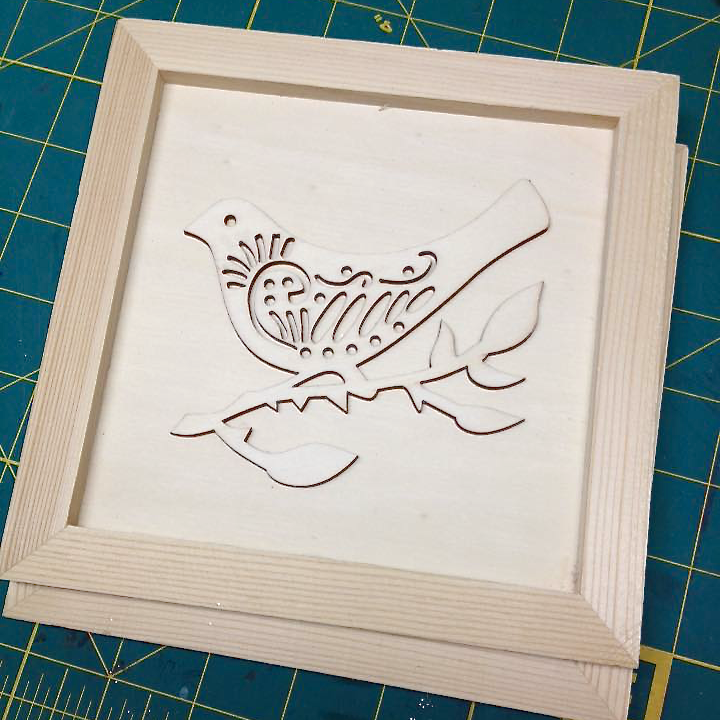 Yes - a lot of work and a lot of fussy cutting, but so worth it. 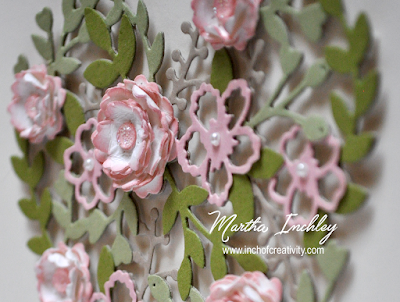 For the flowers I used Whisper White cardstock and sponged the edges with Blushing Bride ink. The small flowers used 4 small flower cutouts and the large flowers used 4 small and 4 large flower cut-outs. I crumpled each flower cut-out and then glued them together in the centre. Once dried, I fluffed up my layers. Didn't they turn out beautiful!?! To complete the flowers I added Blushing Bride, enamel glitter dots to their centre's. How beautiful are those! The enamel dots are a part of the Love Blossom Embellishment Kit. This kit has so much more then just these enamel dots! Foil heart doilies, string of pearls, pre-tied bows and more! The sentiment: ... it's in the air, is from the coordinating stamp set: Bloomin' Love and is stamped in Crumb Cake ink onto Very Vanilla cardstock. 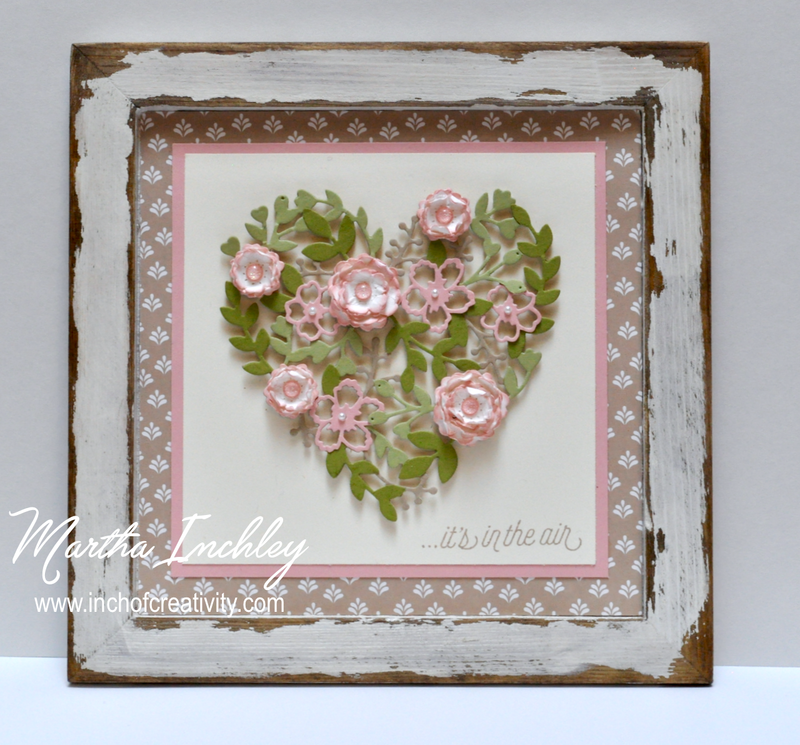 I matted it with Blushing Bride cardstock and then layered it onto DSP from the "Love Blossom" DSP stack. 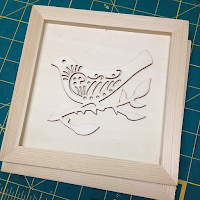 Now, you might be wondering about my frame... well, I couldn't find one that worked with my design, so I found a raw wood piece at the dollar store and transformed it! I removed the bird, sponged the frame with Crumb Cake ink, added vaseline to the edges and corners, painted it white with paint and once it was dry, I wiped it down! Done! Thank you so much for dropping in! I hope you enjoyed my sneak peek of the Love Blossoms Suite. Next up is the VERY talented, Artisan Alumni, and Queen of Pink Buckroo Designs: Erica Cerwin! Enjoy! Perfectly! A nice effect to the frame. Top! Beautiful! Stunning card with so much detail! All worth it is right. I love this card you created! Martha - what a beautiful showcase of this die! My goodness - all the detail that went into layering those tiny flowers - just amazing. Oh this is stunning! You did such a great job of highlighting all the detail in this die! Unbelievably beautiful. This would be a very special bridal shower or wedding gift tha would be cherished. You rock. How did you do the flower with the pearl in the middle? I am drawing a blank what that is... unless you cut out the centers? Yes, how did you make the cut out flowers? The flowers with the pearls in the middle are just the flowers in the die cut out. I just simply cut them out from pink pirouette cardstock and glued them over top. ABSOLUTELY GORGEOUS!! Thanks for the step by step! !